Each afternoon a line starts to form at the homeless encampment in Minneapolis. Volunteer cooks prepare a hot meal from donated food for everyone who needs one. Some days it's cheeseburgers or sloppy joes. Other days it's chicken with mashed potatoes. Meals are prepared and served next to a large campfire at the center of the encampment. It's just down a steep embankment leading up to Hiawatha avenue, where it crosses over Franklin avenue. Dozens of tents stretch in both directions. Here, people come to warm up, get a cup of coffee or look through a table overflowing with clothes donations. On a recent afternoon, a new volunteer, Sherri Villebrun, sat bundled up on a folding chair next to the fire, stirring a massive vat of mashed potatoes. About a hundred pounds were just donated from the Leech Lake Band of Ojibwe. "I got about five sticks of butter in this pot, so they should be good and buttery," Villebrun said. "Now if it were up to me I'd put a lot of salt and pepper but there are probably a lot of people who don't need salt." 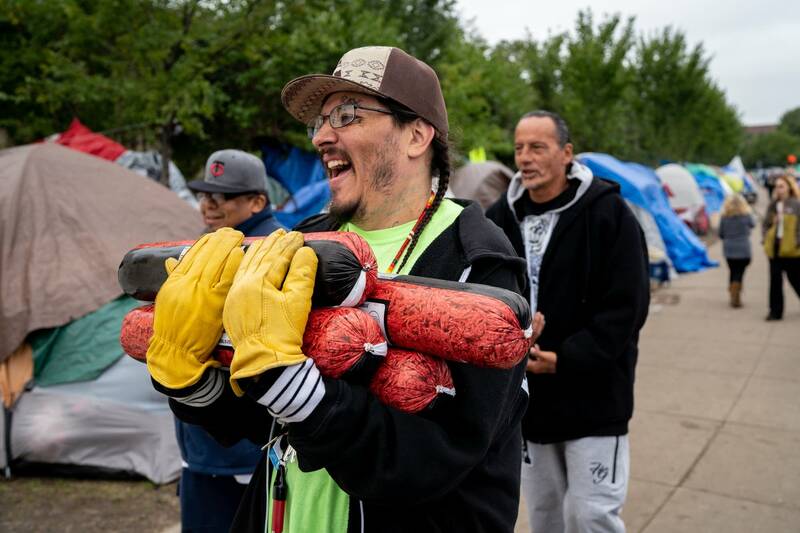 Villebrun, a member of White Earth Nation who lives in St. Paul, says she volunteers out of gratitude to a street outreach group that tries to help people who have overdosed, including her nephew. Natives Against Heroin has a big tent next to the campfire, where they take shifts doing security. They say they break up fights and administer the overdose antidote naloxone, also known as Narcan. They also help organize the stream of donations of clothes and tents and food that come in throughout the day. James Cross, the founder of the group, says they also try to make sure people get a hot meal. On this afternoon, they bought 300 pieces of fried chicken. When the food is ready, women, children and elders are served first. Many days church groups, local businesses and even some individuals prepare enough burritos, chili or pizzas to feed the approximately 200 people living at the encampment. 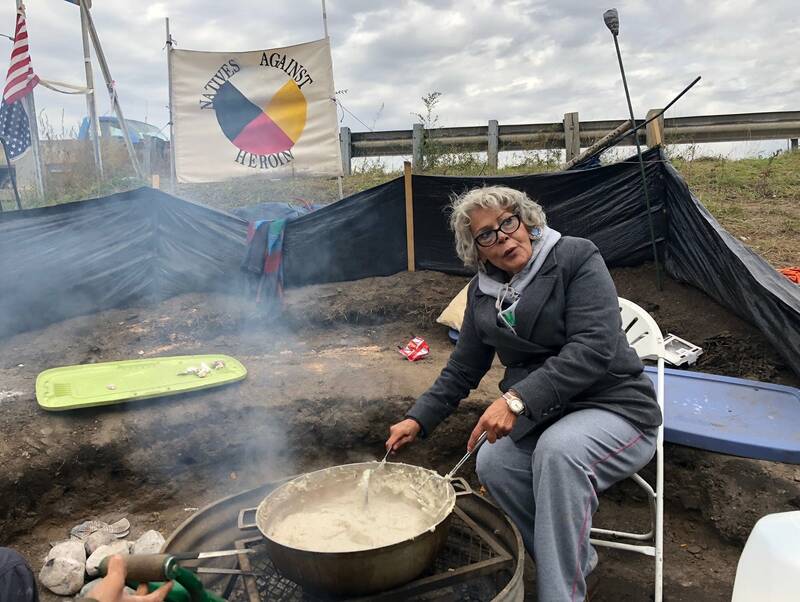 Camille Gage was hired by a coalition of native-led nonprofits in the Twin Cities to coordinate clothing and food donations through a website she set up for the encampment. "We try to make sure that five meals don't come one day and no meals the next," Gage said. 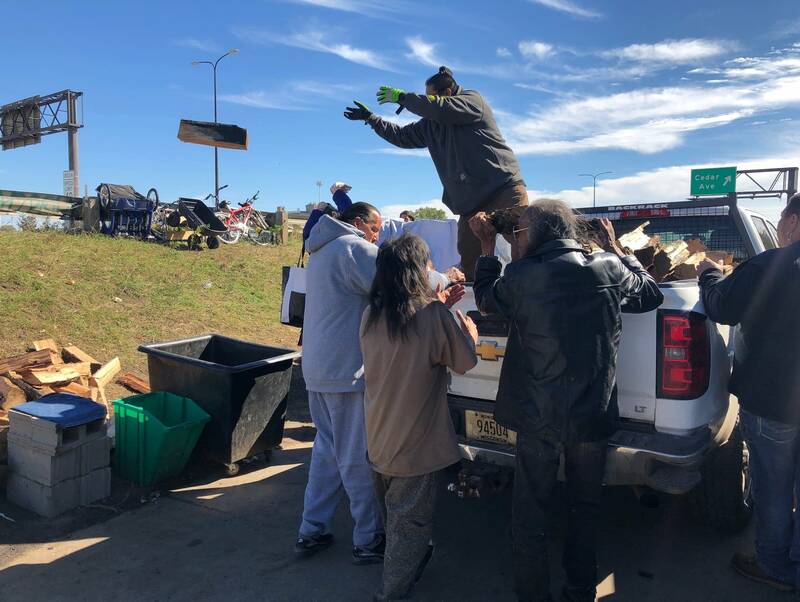 The city of Minneapolis and tribal leaders are working to set up a temporary shelter just across the highway by December. Meanwhile, nonprofit and government workers show up daily to provide flu shots or get people signed up for drug and alcohol treatment. But feeding people at the camp is up to volunteers. When there's not a hot meal, Natives Against Heroin will buy hundreds of pounds of hamburger with donations they've collected. Other groups have stepped up to provide daily meals, too. Gage says the American Indian Community Development Corporation sends hundreds of bag lunches each morning, which some residents pick up on their way to work. They also have been directing nonperishable food donations to Gichitwaa Kateri Catholic Church. But despite Gage's best efforts at coordination, sometimes hundreds of buns or dozens of doughnuts show up unannounced. She says the food and effort to serve it are always appreciated. "It's no mean feat to bring enough food for 200 people to an intersection on East Franklin and cart it all in and plate it all out," Gage said. Angela Senogles-Bowen, a Leech Lake member who's lived at the camp for two months, says she appreciates how the encampment has brought the community together. "It kind of feels like way back when when the tribes were a big tribe. Like 200 years ago the way it was," Senogles-Bowen said.